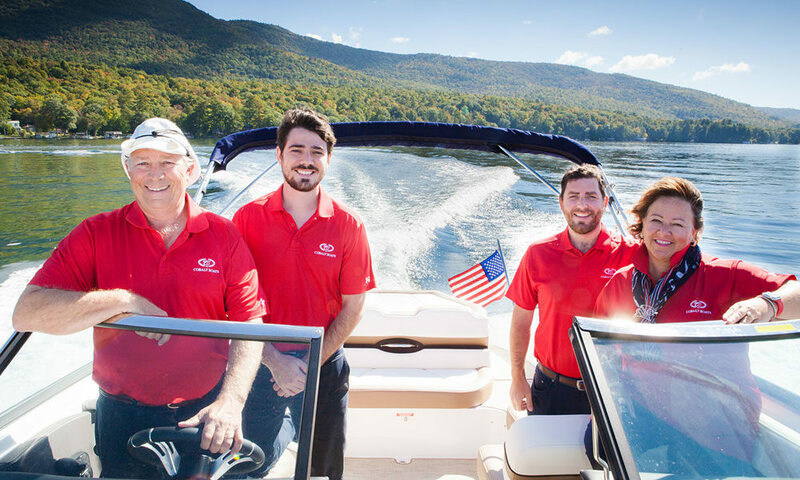 Founded by George Pensel in 1982, Boats by George is a second-generation, family-run boat business based in the Lake George area. Whether it be new or pre-owned, Boats by George has helped boat enthusiasts and first-time buyers find the boat of their dreams, servicing Lake George, Lake Champlain, Saratoga Lake, Lake Placid, Schroon Lake and all of the Adirondacks. With its showroom located conveniently off of exit 20 of I-87 and two marinas on the pristine shores of Lake George, plus a service center in Fort Ann, there’s no boating service or need that Boats By George can’t fulfill. saratoga living recently spoke with Boats By George’s Adam Pensel about what makes his family business so special. Tell me about this big Ice Out Party coming up on April 27 and 28. The Ice Out Party and Demo Days event is an opportunity for us and our customers to celebrate the arrival of boating season, while also giving prospective boaters a chance to tour our Lake George facilities, and get behind the wheel of a wide range of boats, back-to-back, for direct comparisons. Think of it as this: a lakeside cookout with some live music and boat rides. What makes Boats By George different from other similar businesses? It starts with my father, George. He has such a passion for taking care of people the right way, and I think everyone in the company just feeds off of it. He’s there, greeting customers and sometimes jumping right into their boats with a screwdriver to fix things on the fly. I’ve been to a lot of boat companies around the country, and I can tell you first hand that very few owners are still getting their hands dirty. We have a wide range of people from all over, but generally speaking, it’s families, young and old, looking to make memories on the water. We have something for everyone here: Malibu, Axis Wake Research, Cobalt, and Chris Craft. Each brand fills a niche and provides our customers with a diverse selection. How do you help clients and customers select what they want? We like to sit down with new clients before they even look at boats to ask them a series of questions about their specific needs. Sometimes, I’ve had customers come in thinking they wanted something specific and ended up with an entirely different boat, because they’ve never had anyone ask these questions before. But they’re important; we want to help our customers get it right the first time.